Does Fruit Give You Energy? Which Fruits Give You Vitamin E? Fruit alone will not help you gain muscle mass. 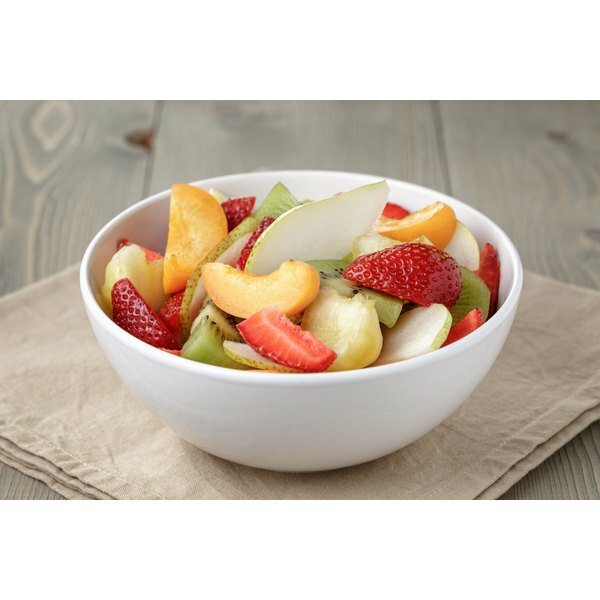 Fruit, however, is a healthy source of the extra calories you'll need to gain weight, and includes many nutrients that are helpful in building muscle. An athlete who incorporates fruit into his exercise and nutrition routine will have more success than one who gets the extra calories from fast food, peanut butter and beer. Eat 200 to 300 calories per day above what you need for your regular diet and exercise plan. Although you will need extra protein, try to make half of these calories come from eating fruit. Engage in a regular course of high-weight, low-rep weight lifting exercise. Without such a program, all your extra calories will end up as fat. Eat fruits high in vitamin C, which is vital to your body's healing. Building muscle happens as your body heals from the damage done during workouts. Some fruits high in vitamin C include oranges, tangerines, kiwis, limes, lemons and tomatoes. Eat fruits containing B vitamins. The various B vitamins facilitate the body processes responsible for healthy tissue and tissue growth. Vitamin B-rich fruits are less common. However, avocados, bananas and oranges contain significant amounts. Eat fruits rich in zinc. Your body uses zinc both in building muscles and for healing and immunity, all important factors in successfully building muscle mass. Fruits that contain lost of zinc include avocados, blackberries and pomegranates. Consider fruit juices as an adjunct to your high-fruit weightlifting diet. Fruit juices deliver calories fast -- which is useful when you're loading extras every day. Also, many fruit juices are fortified with extra minerals. You get more "bang for your buck."